In the coffee industry, Keurig has made a name of itself and it is one of the most recognizable brands around. Their single-serve brewers are considered the best in the market for their durability and high-quality results. Keurig K-Cup in Room Brewing System is no doubt one of the best Keurig you might been looking out. It is a name to reckon in the list of finest Single-Serve coffee makers. It is simple, easy-to-use, it does the job well, and it affordable at the same time. With a weight of just 7.2 pounds, the Keurig K cup in room coffee maker is portable and it has a sleek modern look. The dimension of 10 x 7 x 11 inches enables it to not occupy too much counter space, plus it gives a striking look to the kitchen counter. This coffee maker follows the same pattern that Keurig has been following for years, convenience for the user. It is hassle-free; there is no need of measuring or grinding the coffee beans. The brewing will start straightaway as soon as you pop in the K-cup after adding water into the single-use reservoir. Making a good cup of coffee requires taking cautious measures and one has to be precise with everything, in other words, you have to master the art of making a coffee. It is a dream come true for those people who want a quick quality-cup of coffee without going through much trouble. The single-serving ensures that you won’t be getting a staled and dilute cup of coffee. The problem with cumbersome coffee makers is that they make coffee in large amount, and you have to suffice with coffee that is tasteless and stale. Individual serving guarantees that a fresh cup of coffee is always available. With Keurig K cup in room coffee maker, nothing goes to waste at all. It is small in size and its consumption of electricity is not that much, yet it turns off automatically in case of any inactivity. The machine is manufactured in such an impressive way that it offers a lot for a small unit. You can easily manage the strength of the brew according to your taste. An adjuster gives you an option of choosing how you want your coffee to be brewed and it never disappoints. An indicator light turns on after one 8-ounce cup is perfectly brewed in less than 3 minutes. It is swift and taste wise it always hits the mark. It is built in such a way that it can withstand extensive use and abuse for a long time. 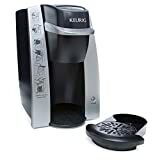 For a small unit, providing good quality coffee is a big achievement, and Keurig K cup in room coffee maker provides both good quality coffee and durability. It requires no extra care and it can be cleaned and maintained quite easily. The price is where Keurig K cup in room coffee maker wins the race. It is highly cost-effective and comes in a price range that is easily affordable for everyone. Moreover, shopping K cups is not much to worry as many brands and flavors are available out there. The final verdict about this coffee maker is that it is best for office use and as an alternative for bulky coffee makers used at home. Everyone needs an alternative for everything and it is a best alternative coffee maker that you can have.